Photo age preventing concentrated serum for every day. bottle with a dropper for clean and comfortable application. Synergy is the solution to extracting the very best abilities from selected ingredients. Advance antioxidant serum with FUSION FORMULA® featuring Asiatic Acid, Vitamin C and E utilizes synergistic interactions of its ingredients to provide unmatched protection on the skin’s surface to PREVENT damage (according to 3 SkinCareActs™) caused by environmental pollutants and UV radiation. Vitamin C crystals brighten skin while guarding it from free radical damage. 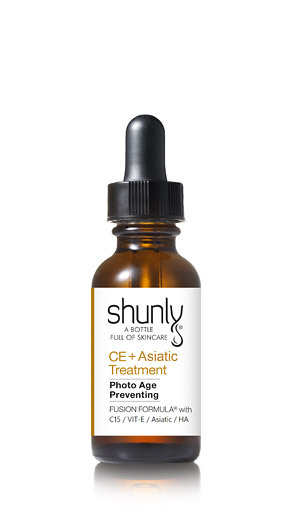 Vitamin E provides soothing, healing, and moisturizing properties while protecting against environmentally induced oxidation in the skin’s outer layer while Asiatic Acid is a super antioxidant that can neutralize free radicals, prevent sun damage, while enhancing Vitamins C and E action. This exceptional formula enhances beauty by stimulating collagen production, boosting antioxidant performance for a brighter, more radiant, even toned, youthful looking complexion. Treats skin by lightening age and brown spots, erythema (redness), hyperpigmentation as it smoothes and softens fine lines and wrinkles. 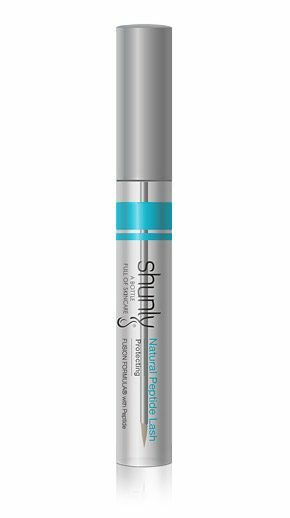 Consistent use of this serum will boost the performance and effectiveness of any other Shunly Skin Care products used in your daily skin care regimen. Use twice a day. Apply 5 to 7 drops onto cleansed and toned face, neck, and décolleté. Avoid direct contact with eyes. A slight tingling sensation may be experienced from the high potency of vitamin C supplied. This is normal and should dissipate shortly after. For optimal results use together with other Shunly Skin Care’s innovative products, including Fusion Formula SPF. We recommend to keeping vitamin C serum between 35°-40°F to prolong the shelf life, clearness, and increase stability. Deionized Water/Aqua/Eau, Vitamin C (L-Ascorbic Acid), Alcohol Denat., 1,3-Dihydroxybutane, 1,5-Pentanediol, Glycerin, Zinc Sulfate Heptahydrate, Vitamin E (d-tocopherols), L-Glutathione, Asiatic Acid, Polysorbatum 20, Polyoxyethylene 3 Lauryl Ether, Citric Acid, Alpha-Arbutin, Bioflavonoids, Phenoxyethanol, Hydroxyethyl-cellulose, Hyaluronic Acid. My skin has completely changed since I’ve been using Shunly products!